Montrose is 40 miles south of Aberdeen and 30 miles north of Dundee on the A92. There is a regular train service from Edinburgh and Glasgow and the Visitor Centre is about 25mins walk or a short bus ride away. There is a regular bus service from Aberdeen and Dundee. 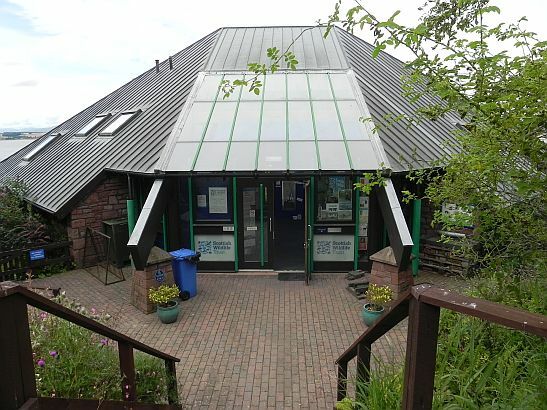 The Scottish Wildlife Trust Visitor Centre is the first place to come to get all the current information about what is to be seen and where to go. 20 m from car park (20 spaces). Ramp from designated disabled parking space. Interpretation area on three floors. Viewing Gallery (heated in cold weather) has seating for 16. Telescopes and binoculars provided. Wheelchair access to main floor only. Assistance in finding and identifying birds provided by Staff and Volunteers. Hot drinks machine plus cold drinks and snacks. Gift shop. East end of Visitor Centre car park, down steps. Bench seating with opening windows. View over salt pans. Good for water rail, heron, kingfisher, little egret. One mile walk on farm track from Old Mill car park. Three-quarters of a mile walk on farm track from Old Mill car park (often very muddy so wellies necessary). Raised on stilts with view over sea wall onto foreshore. Best at high tide when ducks and waders brought close in to shore. 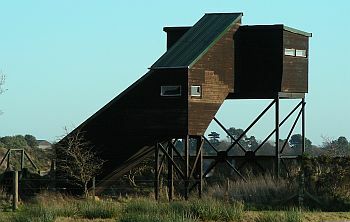 Metal structure with viewing slits. No seating. Good views over Basin. Best views of pink footed geese in autumn. Good views of ducks and waders at low tide. Access to the Basin for members of the public is described below but call in to the Visitor Centre for more details. The tidal part of the Reserve being "foreshore", the Public has legal rights relating to those parts between mean spring high and mean spring low, water marks. These rights include access, wildfowling, bait digging and launching boats. However, being a Local Nature Reserve, activities and access may be controlled by byelaws. The public has the right to use boats in the channel of the South Esk as far upstream as the weir adjacent to the Lurgies (NO676576) and also in the area called the Trout Shot adjacent to the shore of Rossie Island. Two public rights-of-way exist within the LNR: one (by habit and repute) between Old Montrose Pier (NO676572) along the Lurgies sea-dyke and the South Esk bank to Bridge of Dun (NO663584), the other (shown on the 1865 O.S. map) between the south end of Rossie viaduct (NO708565) and Rossie Mills (NO695565) from where the route passes south to the A934. The route within the Reserve runs along the base of Craig Braes and the tideline to the west of there. 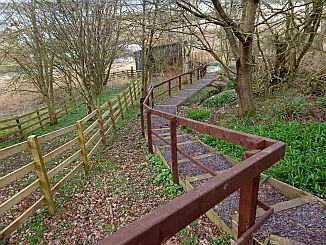 The Scottish Wildlife Trust has a right of access to its hides and the Basin, using trackways on the National Trust for Scotland property, Mains of Dun, at the western end of the Reserve. 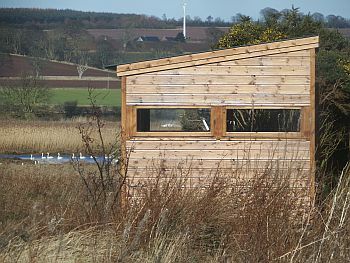 Holders of permits issued by Angus District Council for wildfowling or research, and those intending to use the hides maintained by the Scottish Wildlife Trust are also entitled to use these routes. Note there are no road signs to any of the Reserve access points except the Visitor Centre. Copies of the Reserve map (above) and OS Map 53 are available from the Visitor Centre. Vehicles: The Main car park for visitors to the Reserve's western end is at the Old Mill, Mains of Dun (NO669591). This is outside the Reserve boundary and is best reached from the A935 Montrose-Brechin road. View-points accessible to vehicles are situated on the A92 and the A934 on the southern side of the Basin - the main one being at the SWT's Visitor Centre situated at NO 700564. Old Montrose Pier (NO676573), off the unclassified Maryton-Barnhead road on the southwestern side of the Reserve. Under the railway viaduct in the south-east corner (NO707567). At this point, the road alongside Bridge End Garage passes under the northern end of the viaduct and around the edge of Rossie Island. The road is a dead-end but there is a small car park next to the sailing club. Northeastern quarter of the Basin may be reached by vehicles turning south off the A935 just east of the Tayock Burn at NO708590 and parking is available there. It is also possible to park along the Sleepyhillock Road, which gives access to the north shore of the Basin near there at NO703589. Although it does not give access to the Reserve, the footbridge over the railway at Montrose station is an excellent viewpoint (NO712580).